The archangel Sachiel is also known as Zadkiel (the Righteousness of God). As Zadkiel, he is an extremely exalted angel in charge of the Sephirah Chesed (Divine Mercy) and the angelic choir called the Chashmalim (the Brilliant Ones). 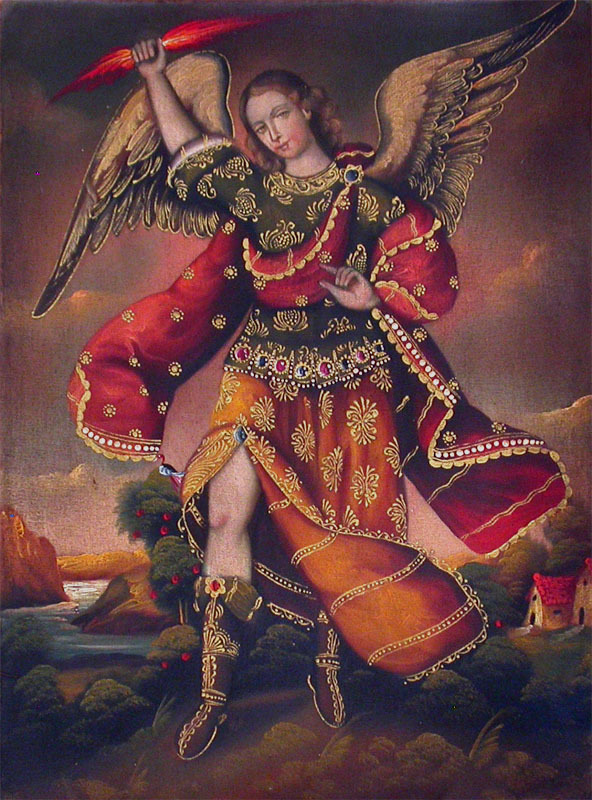 As Sachiel, he is the supreme archangel of Jupiter and Thursday, as well as the sixth heaven called Zebul. He is the angel of righteousness, benevolence, mercy, forgiveness and freedom. It was Zadkiel/Sachiel who stayed the hand of Abraham before he could sacrifice his son Isaac. Zadkiel and Iophiel (the Intelligence of the planet Jupiter) are both considered standard-bearers who follow Michael into battle. During the work, I was also directed by the angels to make specific changes to the prayers outlined in the Treatise…. Mostly inserting the proper name of God (El, in the case of Jupiter) into the invocations at certain points, along with a clear statement of purpose at a point where the given prayers merely ask for general guidance and support from the angels. We decided to make four talismans at once. Not only is it the number of Jupiter, but it allowed each adult in the house to keep one while we placed the fourth in a specific location on our property (as directed by Sachiel). Like last time, we used a mold to cast the talismans at the end of the process – this time being our first experiment with creating a silicon mold. I prepared myself for three days before I began the consecrations. It started with a full Solomonic Bath, after which I began a vegetarian diet, general seclusion and complete sexual abstinence. There is also a prayer in the Key of Solomon that asks God to show kindness and mercy and see to it that the spirits one intends to call should appear. (See Secrets of the Magickal Grimoires, p. 215.) I recited this once in the mornings and twice in the evenings. The ritual began on the next Thursday. At that time (actually the Wednesday night beforehand) I began to fast each night after sundown. I continued the diet and seclusion as before. Once the process was complete, we wrapped the talismans in blue cloth. We asked Sachiel to provide us with any necessary information on how to best use the talismans, along with anything specific he wanted for his offerings. We planned to make the offerings seven days later – on the next Thursday – but circumstances arose that made that impossible. So we waited another seven days and made the offerings on the next Thursday instead. The offerings were standard Jupiter fare – flowers (violet and orange this time), apples, cranberries, nuts, various cooked vegetables (corn, green beans), sheaths of wheat, etc – all in fours or multiples of four. 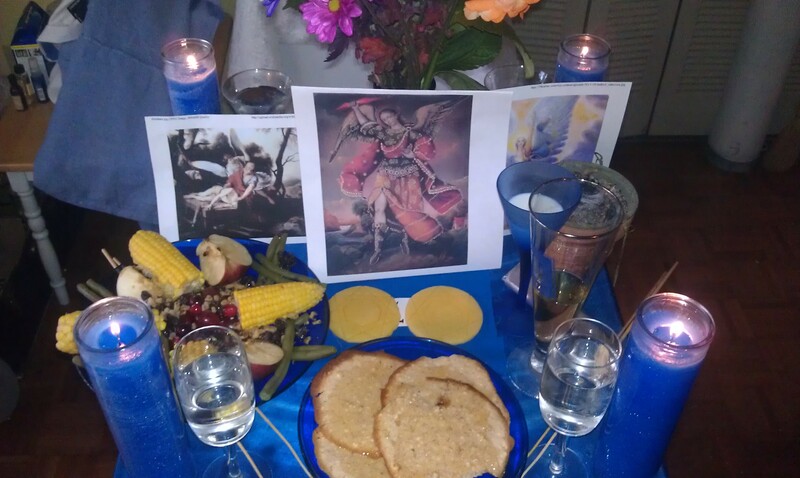 We included four blue seven-day candles and four glasses of water, as well as a glass of milk and a glass of honey mead. 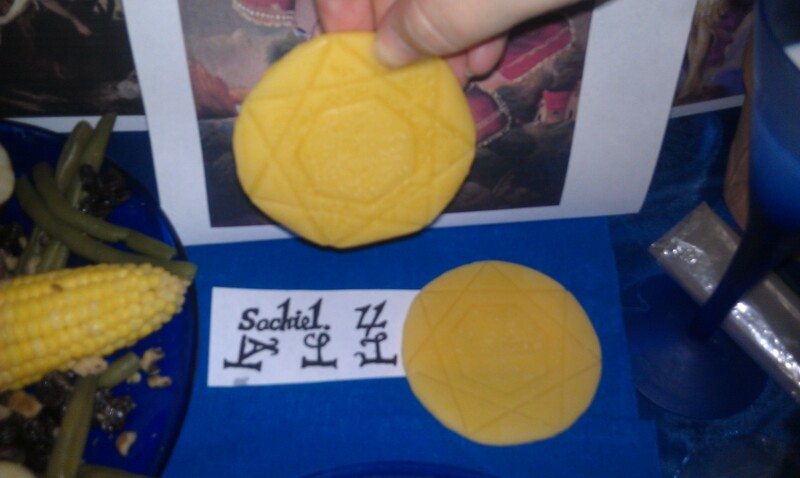 I also made four Jupiter Cakes once again (see the Iophiel invocation for full instructions and photos) and covered them with fine honey. 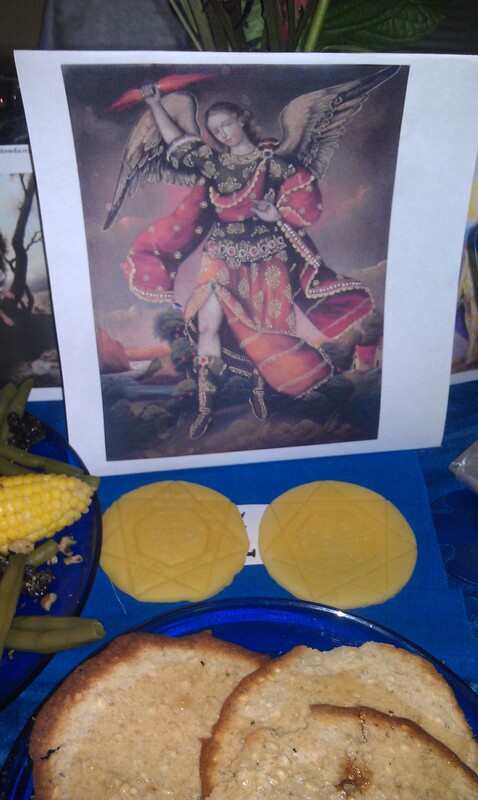 Also, as I did with Samael before, I included the consecrated wax left over from the talismans. I inscribed Sachiel’s name and seal into the wax, then (at his request) wrapped it in blue linen. All of this will rest on the altar for four days, then what is left over will be taken to the river. 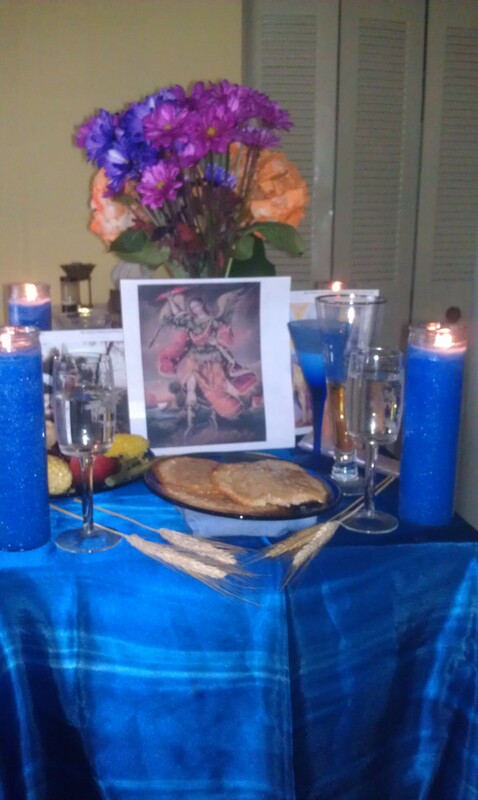 We made the offering on an hour of Jupiter. My usual choice is dawn, but we had some last minute items to pick up and so waited until the second Jupiter hour of the day. At the proper time, I made the Jupiter cakes and Carrie boiled the vegetables. Then I went to take a brief cleansing bath, then prepared the sacred space and altar with holy water and a recitation of Solomon’s Consecration Prayer for the Temple. Then we assembled the offerings onto the altar and performed the invocations. Seems like a beautiful operation, I hope your questions were answered. Thank you for sharing. Very nicely done Aaron! Bravo! Excellent post; I need to incorporate some of these ideas when Jupiter goes direct again. You mentioned that the name of the sixth heaven was Zebul; where’s this name from, and what are the names of the other heavens? Sounds great! 🙂 As for Zebul and the other heavens, you can find them listed with the seven archangels in the Heptameron.